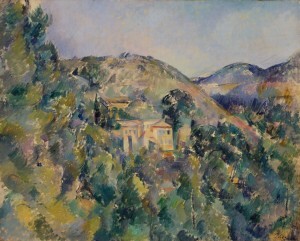 Colline de pauvres was the only one of Cézanne’s oil paintings to sell from the exhibition. Although Vollard originally priced the work at $8,000, it eventually sold to the Metropolitan Museum of Art for $6,700 – the highest price paid for any work in the Armory Show. This sale represented a major landmark in American collecting, as it was the first Cézanne painting to enter into the collection of an American museum. Charles S. Moffett, Impressionist and Post-Impressionist Paintings in the Metropolitan Museum of Art (New York: Metropolitan Museum of Art, 1985), 201. John Rewald, Cézanne and America: Dealers, Collectors, Artists and Critics, 1891-1921 (Princeton: Princeton University Press, 1989), 206. Pavel Machotka, Cézanne: Landscape into Art (New Haven: Yale University Press, 1996), 82. “International Art,” The New York Evening Post, February 20, 1913, 9. Milton Brown, The Story of the Armory Show, 2nd ed. (New York: Abbeville Press, 1988), 131.